The winning team shows off its creation. Janie Simms Hipp is second from left, and Kathleen Fluegel is near center in red-rimmed glasses. It was an event like no other – the first-ever “Cheese Grater Championship” – intended to illustrate the challenges that many low-income Native American families face when preparing healthy meals using “commodity food” packages. 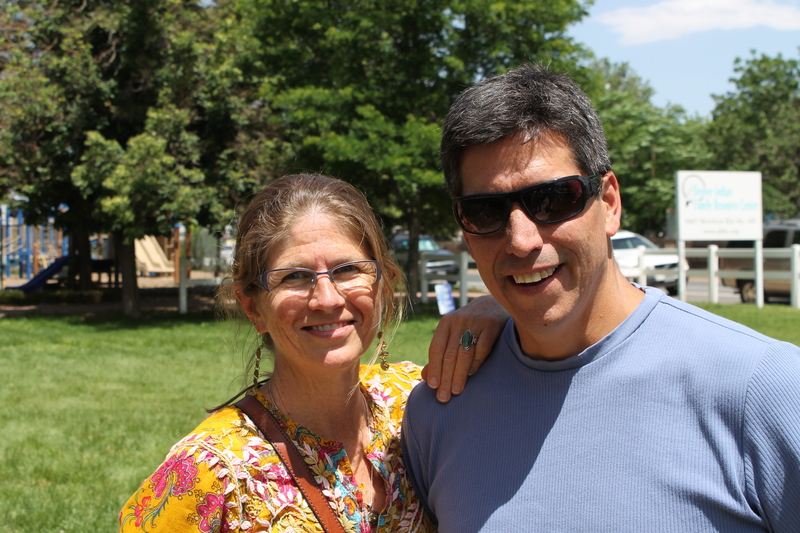 “The event was eye-opening for some, sobering for all,” according to Virginia Clarke, executive director of the sponsoring organization, the Sustainable Agriculture and Food Systems Funders (SAFSF). SAFSF held its annual forum in Denver in June 2014. The group is an international network of grantmakers (foundations and others) who are active in supporting economically viable, environmentally sound and socially responsible systems of food production, processing, distribution and consumption. SAFSF hosts its forum in a different state each year and is well-known for site visits that are designed to make tangible, visible and real some of the most critical issues affecting agricultural and food systems. As part of the forum, the planning committee wanted to highlight Native American food projects and issues. 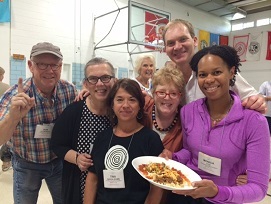 As an SAFSF member, First Nations Development Institute President Michael Roberts suggested and coordinated the Cheese Grater Championship, a Food Network Chopped-style cookoff like no other, where teams of forum attendees were given a selection of foods found in food-assistance commodity packages that are distributed on Indian reservations (under the USDA’s Food Distribution Program on Indian Reservations). The teams then had to prepare a meal that not only would be judged for the contest, but which was lunch for the day. The event took place at the Denver Indian Center, where the SAFSF group also heard about the center’s many programs, including its Indigenous permaculture garden project, the work of the Denver Indian Family Resource Center, an update from regional USDA officials, and insights from Janie Simms Hipp, J.D., LL.M., founding director of the Indigenous Food and Agriculture Initiative at the University of Arkansas School of Law in Fayetteville and who previously was senior advisor for tribal relations to USDA Secretary Tom Vilsack. 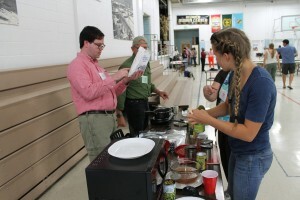 The cookoff took place in the center’s gymnasium – competing with summer youth campers for space. 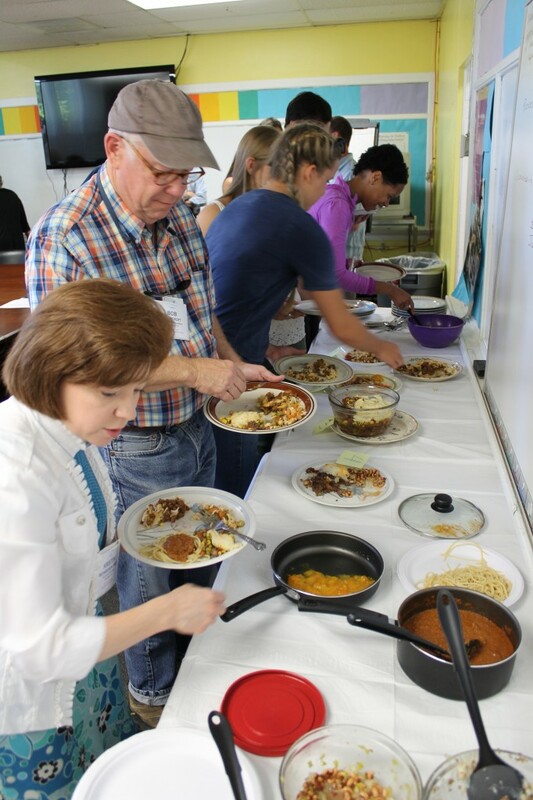 Teams assessed the basic food staples they were given – blocks of “government cheese,” vegetable oil, canned beef (“with juices”), instant potato flakes, powdered eggs, dry nonfat milk – debated possible recipes, assigned responsibilities and got to work! 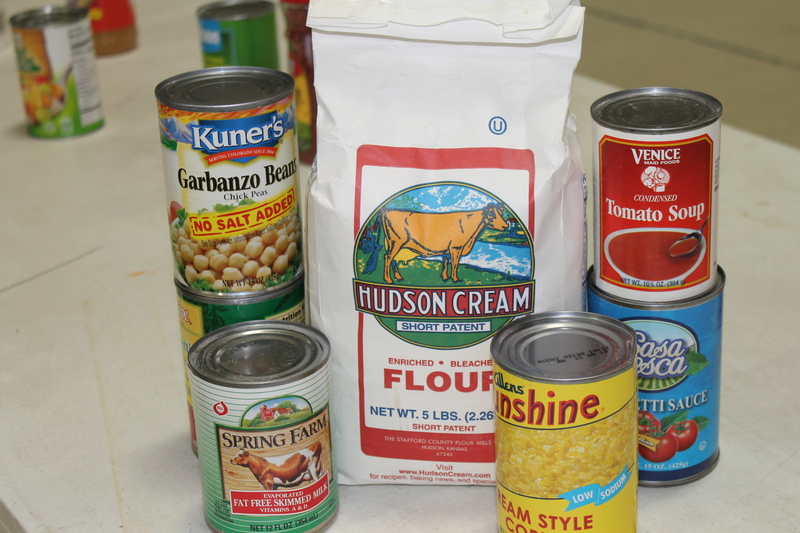 Teams were also able to select additional items from a general “pantry” that included canned vegetables, beans or fruit, canned sauces or soups, Hamburger Helper, enriched flour, noodles or rice, peanut butter, mac and cheese mix and a few other choices. Basic cooking stations were equipped with limited kitchen utensils, pots and pans, a cheese grater (of course! ), a hotplate and microwave oven. Ever heard the expression “too many cooks in the kitchen”? This event was that – and much more. 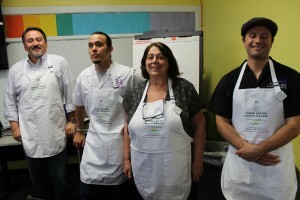 But every team did its best to work together to create a meal worth judging – and eating – under the 30-minute time limit and limited circumstances. 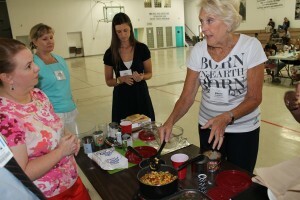 The completed meals were, well, edible even if not so tasty, nutritious or well-balanced. No people were harmed in the making of these commodity meals, but who would have thought that a package of taco seasoning could be so valuable? While designed to be fun and engaging, the not-so-hidden intention of the event was to bring awareness to what having limited or no access to fresh, healthy food means – literally – on one’s plate. 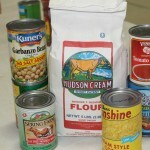 USDA food packages have improved over the years, but still have a ways to go. 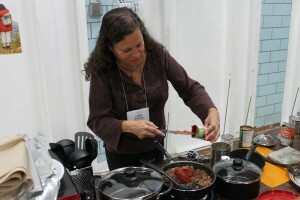 Issues like obesity, diabetes and heart disease – all of which are evident in too-high numbers in many Native communities – and all of which are greatly affected by nutrition and diet, were forefront in participants’ minds as they cooked, chopped, stirred and ate their meals.